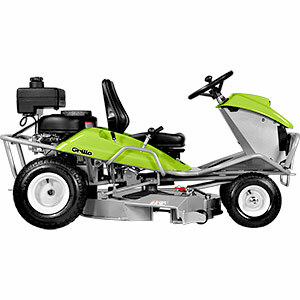 Hydrostatic lawnmower with a dual function cutter deck, side discharge and Mulching, equipped with a 10 HP engine! 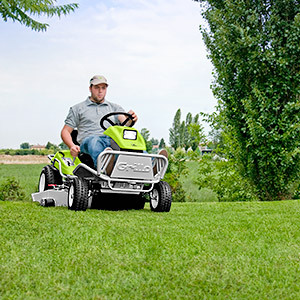 The MD13 is a hydrostatic lawnmower with dual function cutter deck incorporating a “Quick Shift” levers which allows you change from side discharge to mulch mode whilst remaining comfortably seated on the machine. 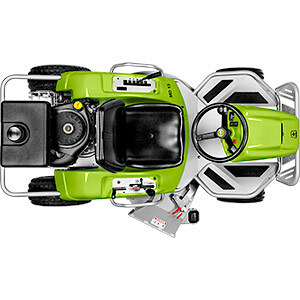 The Grillo MD13 has an electromagnetic clutch and is ideal for cutting lawns even on slopes. 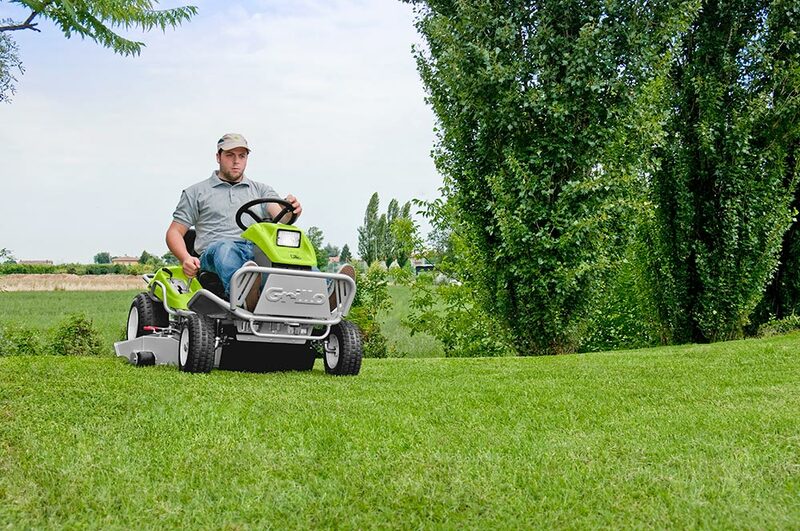 The powerful 10HP engine, its easy manageability, smooth steering action and fast work speed make the Grillo MD13 a rapid and efficient machine, which is, at the same time, a pleasure to use. The innovative 83 cm single blade cutter deck will always produce an excellent finish! With the possibility to choose among the mulch or side discharge, the MD13 will always be 100% efficient. 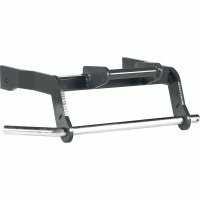 The “Quick Shift” lever allows you to change the cutting modes whilst remaining comfortably seated also during the cutting procedure and without stopping. There is no need to change the blades between the different modes. The cutter blade’s swing tips are shock-resistant and their special cutting profile ensures a precise cut in all conditions. 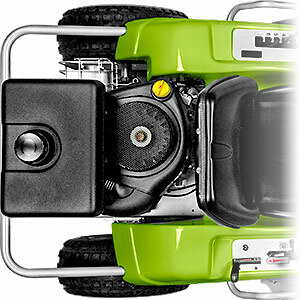 The rear discharge cut mode is ideal when mowing high grass; the grass is discharged outwards through into the steel side chute. The chute is built in compliance with all laws ensuring optimal safety for the operator, and it is further equipped with an anti-scalp roller. The mulch mode is ideal when cutting frequently, the clippings are finely shred and are quickly absorbed back into the ground, therefore giving additional nourishment to the soil. Also the mulch cut mode can be used after the first pass of the side discharge helping to ensure a better finish! 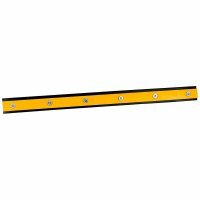 he cutter deck is made of steel and is protected from accidental damages thanks to the very robust side discharge casing fixed with screws. The large diameter blade shaft and heavy duty transmission ensure reliability even under most demanding working conditions for extended periods of work and in complete safety. To further improve the reliability and to protect against accidental damage some of the hinges are positioned inside the casing. 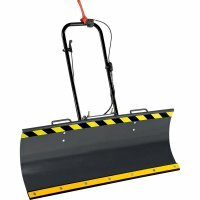 The MD13 is a compact machine with a low centre of gravity, an optimal weight distribution, it is built to ensure maximum stability and safety for the operator. 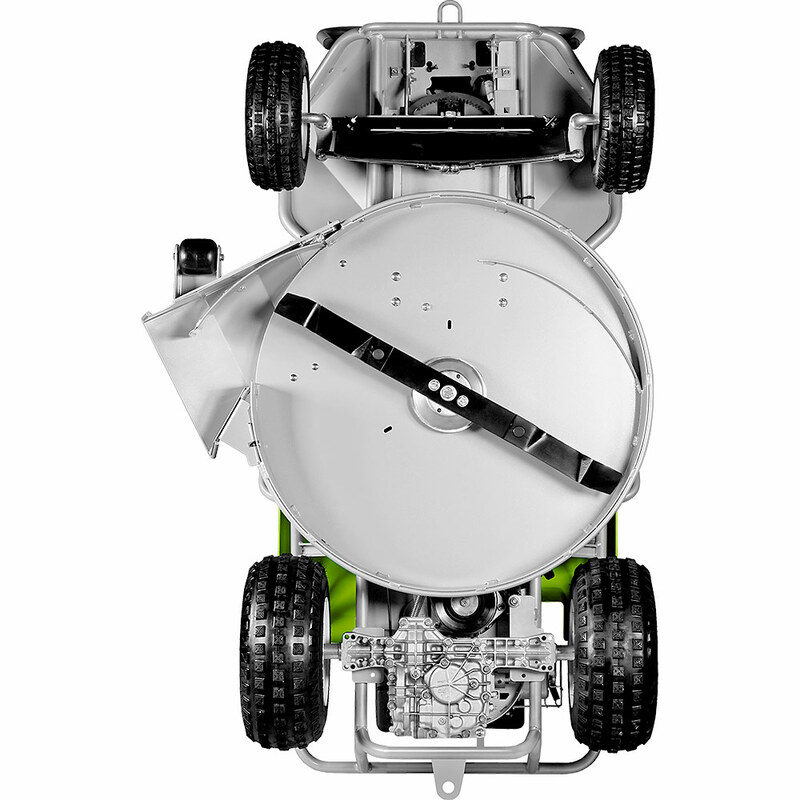 The low ground clearance makes the MD13 ideal for works under low positioned branches. The low positioned seat as well as the very low positioned endothermic engine, with its vertical crank, which is positioned in the centre between the 4 wheels and the battery positioned on top of the front axle, make the machine extraordinarily stable. he extremely small turning radius of just 45 cm allows access in narrow places, it is easy to manouvre around obstacles such as circular flower beds, trees, street lights etc. The turf tyre profile help to keep marks on the grass to a minimum. 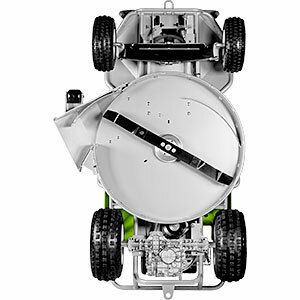 The pivoting front axle keeps all four wheels on the ground even on extremely undulating surfaces. 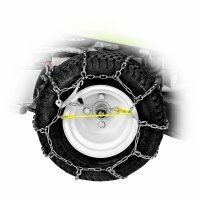 The transmission consists of a hydrostatic axle with an oil cooling fan which is essential to increase the transmission’s output by reducing the working temperature. Speed is continuously variable from 0 to 9 km/h thus allowing a precise choice of the drive speed. The engagement of the blades is made via an electric switch positioned near the steering wheel, which is equipped with a handle. 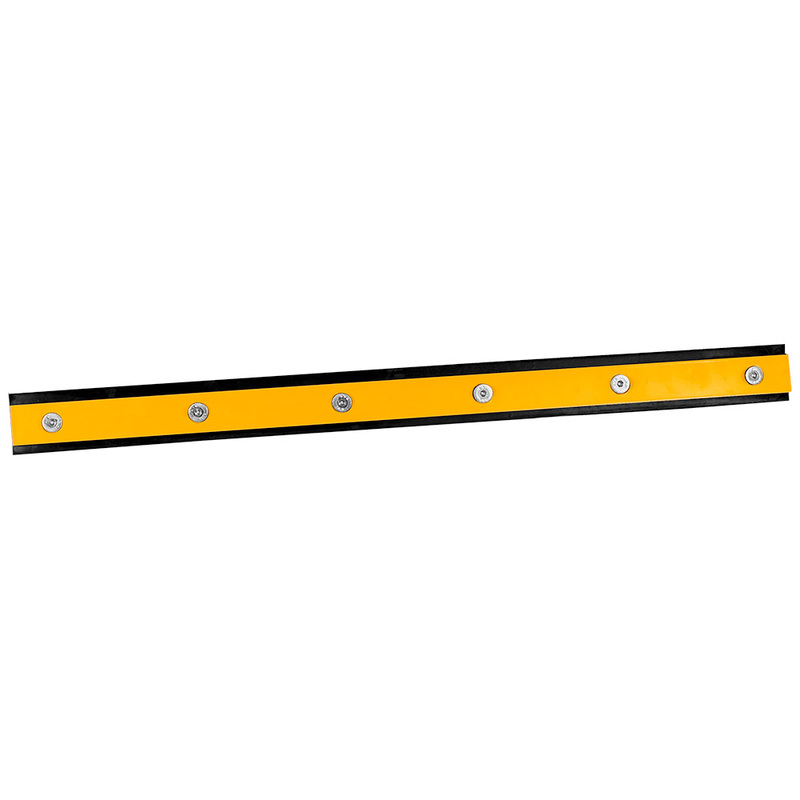 The cutting heights range from 25 to 75 mm and can be adjusted, whilst remaining seated, by means of a lever having 6 cutting positions; this same lever has a further position for transport therefore enabling you to raise the whole cutter deck from the ground by interrupting automatically the blade rotation in order to mount kerbs and pavements without any problem. Belt-tension is self-adjusting. The whole cutter deck is constantly kept parallel to the ground improving its cutting quality even after many years of intensive use! The Grillo MD13 is an extremely comfortable machine! The extraordinary space is derived from a low positioned and longitudinally on 2 positions adjustable platform. The operator’s feet lean toward the optimum angle in order to ensure maximum safety. The drive lever as well as the steering wheel are smooth when engaging them. The seat is dampened, comfortable and longitudinally adjustable. The disc parking brake acts on the transmission. 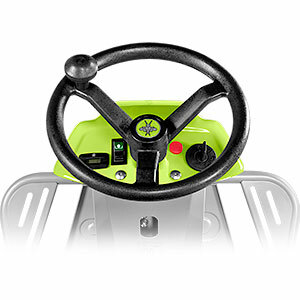 Driving the MD13 will protect the operator from fatigue even after long work periods. 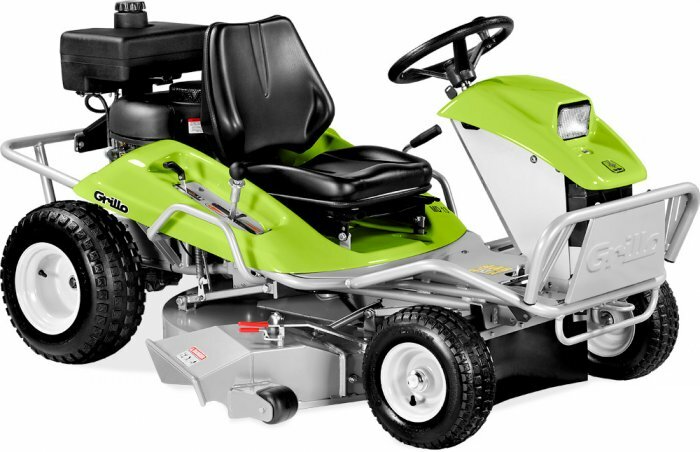 The MD13 is fitted with a Briggs & Stratton INTEK 3.130 AVS petrol engine, a fuel tank with 7 L capacity and electric start. The single cylinder overhead valve engine has a cylinder with a cast iron liner and 344 cc displacement . It incorporates the latest cutting edge technology ensuring reliability, low emissions, reduced consumption, high performance and vibrations reduced to the minimum thanks to the AVS-system (anti vibration system). The air filter is easily accessible for quick cleaning. The aggressive design is up to the minute! The modern lines and the care taken in each detail of the chassis and the fairing catch immediately one's eye! The MD13 passed very stringent tests to check the reliability of the transmission, the cutter deck, the chassis as well as all its components. 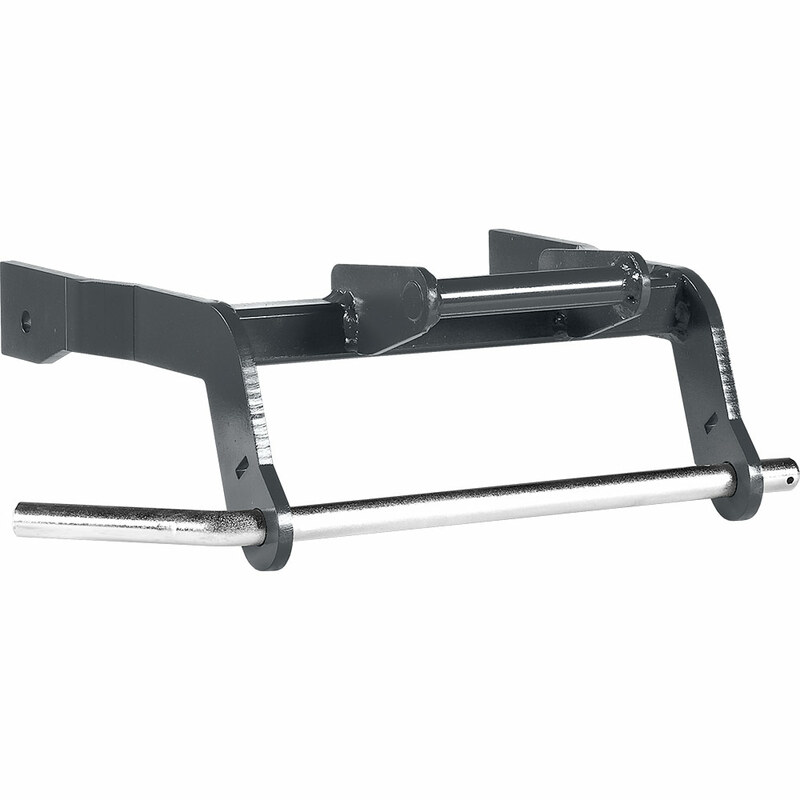 A tow bar, hour metre and front light are standard features. Chassis, cutter deck transmission, cutter deck itself are built by Grillo in Italy by using only premium materials and cutting edge technology. All this to achieve a constant and 100% controlled high level quality. All the Grillo MD13 components have been assembled with care in every detail and tested scrupulously by specialised personnel. Final inspection means a machine whose engine has been run in order to check its performance. This is a further and final guarantee of a high quality product. MD13, as with all Grillo products, is designed and built to last and retain their value over many years. 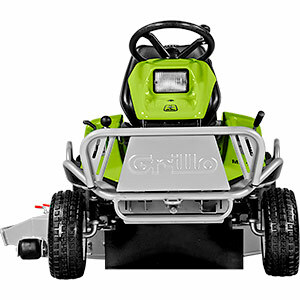 All Grillo products are distributed and serviced by a widespread Grillo specialist dealer net. Spare parts remain available also after many years. 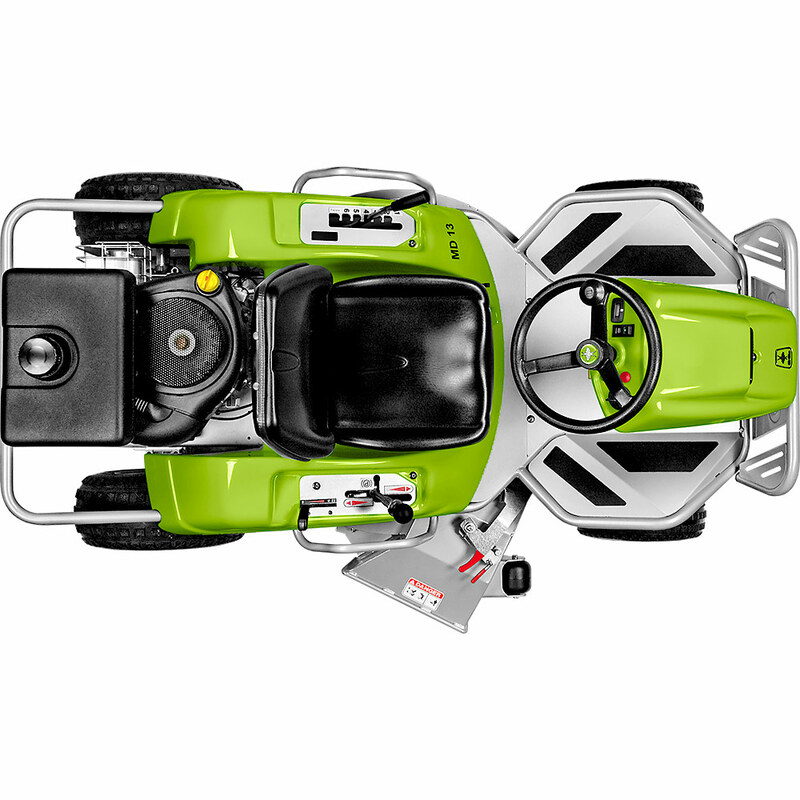 The GRILLO MD13 cutter deck is equipped with a 'Quick Shift' lever which allows you to change from mulching cut mode to side discharge cut mode. 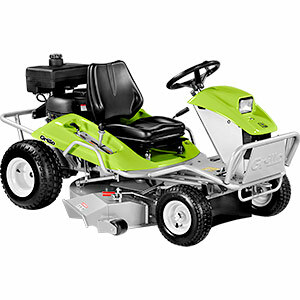 The powerful 13HP engine, its easy manageability, smooth steering action and fast work speed make the Grillo MD13 a rapid and efficient machine, which is, at the same time, a pleasure to use.